Sometimes even a good temporary ice fishing shelter makes all the difference! There are several different ways to enjoy your time out in the ice when you go out for a fun day winter fishing. While some guys wait for the decently warm days to sit out on a bucket in the open, sometimes with half the town out on the thick ice at that point, and in some places once the freeze is confirmed you see seasonal shelters moved out onto the ice. While this can be ideal if you can afford that setup over a reliably good fishing hole, for many of us the answer is somewhere in the middle. This is where temporary portable ice fishing shelters come into play! These are a great alternative to other options, those being the moving of heavy and not really portable shacks that then need to be moved off the ice before spring thaws things out too much or just sitting out in the open – which has plenty of drawbacks on all but the very nicest of winter days. Portable shelters offer shelter from the wind, the insulated ones give some impressive cover from the cold, and provides some good options for having a little camp stove that actually gives off some heat that stays in the insulated area (especially if you gerry-rig some emergency space blankets in the interior). Why not be more comfortable, have some degree of shelter from snow or wind, and get the most out of your winter experience? 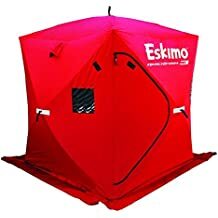 Eskimo FatFish Pop-up Portable Ice Shelter Top of the line ice fishing shelter, both models absolutely top notch. Eskimo Quickfish 3 Pop-up Portable Ice Shelter Outstanding 3-person ice fishing shelter from a trusted brand. ThunderBay Ice Cube 3 Man Portable Ice Shelter Customer favorite with stunningly high ratings. Nordic Legend Wide Bottom Thermal Ice Shelter Great ice shelter that sets up in a mere 60 seconds. 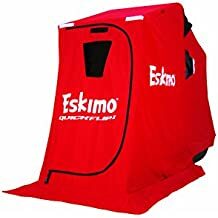 Eskimo QuickFlip Portable Flip-Style Ice Shelter Great package that includes transport sled & seating. Eskimo Evo2 Portable Flip Style Ice Shelter Outstanding flip style shelter with twice the space. 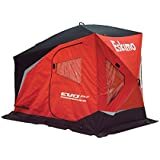 Elkton Outdoors Insulated Portable Ice Fishing Tent Excellent fishing tent offering built-in insulation. Tangkula Ice Shelter 8-Person Pop Up Shanty Largest ice shelter on the list. 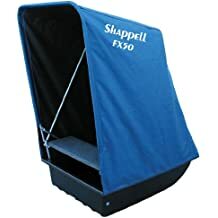 Shappell FX50 Windbreak Ice Fishing Shelter Great easily portable windbreak alternative to traditional ice shelters. 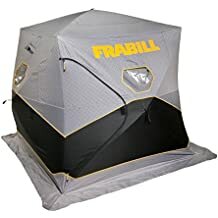 Frabill Insulated 3-Man Ice Fishing Shelter Intriguing new ice shelter design. Standard and Insulated models (while the standard is impressive – better than we honestly expected for a non-insulated model – we still strongly recommend the insulated version) are both available, offering more options and some really impressive ones, at that. This shelter offers 61 square feet of area inside the shelter that can be fished, and the design hub means setting up is fast and easy, and taking down is just as convenient. Add in a high-quality carrying bag and it is easy to see why we like this setup so much. There are six large Velcro windows and covers that allow for ventilation as well as plenty of viewing for warmer days, but can be completely sealed up for when you need to capture and hod the most heat within that small enclosed area. The flare design at the base means more area. Add in some solid mesh pockets in the side and that means plenty of space to keep all your small but essential gear. This shelter comes with six heavy duty ice anchors that you can use immediately, reducing the need to buy them separately (although having a backup pair is never a bad idea), and the specialty designed (and trademarked) IceTight fabric and its high thread count makes it easy to keep warm air in while the outside cold of winter stays out, allowing you more time to enjoy fishing on the ice! Eskimo is a name that has long been respected among outdoor enthusiasts when the lakes freeze over and it’s time to get out the fishing rods and beat the local rush to the best possible fishing holes. Because of this, it should come as no surprise that this brand pops up again towards the top of the list. The Quickfish brand is an ice shelter from Eskimo that is very easy to carry, transport, and adjust as needed to set up your perfect portable ice shelter for the upcoming day. For warmer days there are removable windows that allow for some ventilation, or can be fully covered up when there’s some wind and snow coming down. This excellent portable ice shelter provides winter anglers with mesh storage pockets to keep your most important fishing gear handy and within easy reach whether a tackle box or your favorite pair of fishing pliers, as well as several strong ice anchors so you can make sure to secure your temporary shelter in case the winds pick up. In addition to this, there is some pretty heavy duty material that is sewn at the corners to further reinforce the strength of these portable ice fishing shelters. The insulated version is an estimated 35% warmer than the already well-built standard model, and either one takes a mere 60 seconds for an experienced user to setup. In fact, most your time will be spent hammering in the ice anchors and then getting your gear in the shelter to enjoy what a long day on the ice has to offer! When you have a brand name like ThunderBay, you expect some seriously well constructed outdoor gear to come from that brand. In this case, they pass with flying colors! There’s a reason they’re high up on our list of the top portable ice shelters out there. Woven from 300 denier fabric, known for its extremely tight and durable construction, this shelter is exceptional for blocking out even heavy winds, and a special blackout coating means the light stays out completely unless you want to shift it to let some in. 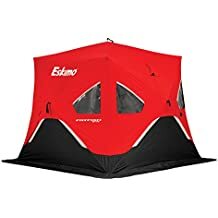 Many individuals use this not only as an ice fishing shelter but also as a dark house or even as a regular tent (with ground cloth) for campers in non-snowy winter areas still looking for a good sleeping shelter for some desert camping. While this is meant mostly as a a portable ice fishing shelter, its versatility really is unmatched. The poles are made of a very heavy fiberglass, while the heavy fabric is also combined with heavy duty aluminum hubs and very heavy duty zippers, too. When you tie it all together, that makes for one just absolutely outstanding tent. A fantastic design with room for three, the wide bottom design of Nordic Legend’s thermal ice shelter allows you to enjoy the maximum amount of space possible when it comes to staking out your area and finding the fishing spot that is going to work. This shelter offers a full 40 square feet of area where you can auger a fishing hole and see what luck you have, and the tent will keep you warm and well insulated from the surrounding weather as you focus on finding those big fish. The design is simple enough to allow set up in less than two minutes, sometimes even less than one in optimal conditions for experienced anglers on the ice. Nordic Legend does a great job with this ice fishing tent design, which is why it appears on our list of the top rated options that are currently out there. The construction is outstanding, as well. The poles are made from a flexible yet durable fiberglass that will hold up against the test of time, specially cast aluminum hubs, and even heavy duty stitching to make sure the fabric is up to snuff. 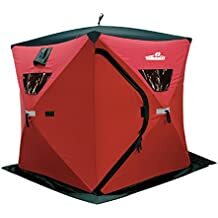 Add in a full six heavy-duty ice anchors as well as a well made carrying bag and you’ll be really hard pressed to find anything missing from this outstanding temporary ice fishing shelter. After a brief break, here is yet another awesome design courtesy of the good folks at Eskimo! You may notice that this shelter looks quite a bit different than some of the others and that’s because this is a one person ice fishing shelter that is designed with convenience for the solo ice angler in mind. Relatively lightweight at 52 lbs, this shelter comes with a 50 inch sled for easy transportation, a tripod chair to provide you with seating, and a double wall design that helps add that extra layer of protection against the winter winds. The round aluminum support poles means this cozy shelter is built sturdy, and if you have a snowmobile or ATV and proper tow bar you’ll find this shelter is even towable. There is a pull rope included for easier movement, and once set up the window panels are actually removable which allow you to shift light and ventilation as you see fit depending on the weather conditions around you. This is an outstanding option for the single ice fishing enthusiast and provides an outstanding option for easy and fast setup without having to sacrifice solid construction or overall quality of the shelter itself. A fantastic addition to this list, and if you’re a solo ice angler you won’t regret this purchase. The Evo2 portable flip style ice shelter from trusted brand Eskimo offers yet another outstanding option for dedicated winter anglers when it comes to having the right shelter to make your ice fishing experience all the more enjoyable. This sled-style shelter uses outstanding design and materials to give you more fishable area that is covered by the shelter. Set as a shelter that can hold two, or is especially roomy and comfy for the solo winter angler, you’ll love the design that includes strong but flexible fiberglass poles, extra large windows (with removable coverings), and the design offers a bit of extra headroom for those of us who are a bit bigger or taller than average. This is great not only for comfort, but you’ll appreciate the extra room when it is time to set the hook. Made from resilient 300 denier fabric under the trademarked IceTight design, these are designed to last winter after winter after winter. In fact, this fabric has a confirmed 59% higher thread count than similar ice fishing shelters. The easy to set up design is extremely popular with many outdoor enthusiasts, and this special design gives all the benefits that come with a flip style of shelter while offering up to twice the room you might be used to if you have used other flip shelters. This shelter is an outstanding option that will give plenty of space for multiple fishing holes and is a great addition for the devoted ice angler. 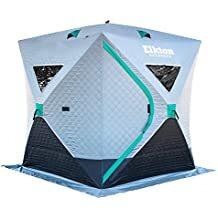 An outstanding design from Elkton Outdoors, this portable ice fishing tent not only focuses on a solid tarpaulin seal to ensure water proofing but these ice fishing tents come already insulated to make sure that every single one does a great job keeping out the wind and cold while helping to keep any body heat, or any heat from a portable heating source, in. Set up is designed to be extremely easy, taking less than a minute in many cases. As you would expect, this shelter is not only easy to set up but it is also easy to take down, easy to pack, and easy to store. This ice tent is 70 inches by 70 inches as well as 80 inches tall. 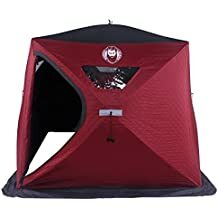 This makes it ideal for two to three people, and has four roof vents as well as two large windows, all with removable covers to adjust as needed to your specific weather situation, or if you need a bit of breeze to air out the inside. Overhead storage pockets give plenty of space for sunglasses, goggles, gloves, small plastic tackle boxes, ice skimmers, or whatever else you need to store while concentrating on the rods and lures. This is an outstanding design, and one that definitely is going to hold up to the test of time. Add in some excellent ice anchors and solid construction and even picky winter anglers will have a hard time finding any issues with this outstanding ice fishing shelter option. This is a really unique ice fishing shelter, and even a basic glance at Tangkula’s ice shelter is going to make it jump out from the crowd. The first obvious difference is the fact that while most ice shelters focus on 1-3 anglers, this one is a giant 8 person ice shelter that offers far more space than about any other temporary shelter you’re going to be able to find. This is a surprisingly light ice shelter that uses solid glass rods with light but strong 300D Oxford fabric to keep this behemoth from becoming unwieldy. This allows much easier transportation and setup on the ice, although it’s important to note that this also makes this a poor choice in areas known for incredibly heavily and cold winds as this shelter isn’t built for constant buffering. That being said, there’s a lot to like about what this large ice shelter brings to the table. The 8 person shelter is very lightweight, is designed to have frost resistance of up to -30 degrees and the windows have detachable coverings so you can adjust the wind flow at will, or block it out completely. While we don’t see this one has having the same level of insulation or overall sturdiness of many other models (the fact it is much larger but much lighter than many other fishing shelters is a dead giveaway to this fact) but it does come with stakes to hold down the tent on the ice and is a solid shelter for decent to moderate winter weather in most places. This is just an outstanding option that will provide a lot of space for the group of anglers looking to take advantage of a nice day when the ice is still thick. Shappell doesn’t get fancy with their designs at all, they get straight to the point of what they do and they do it well. This windbreak ice fishing shelter isn’t designed to provide a full shelter, but it will give the proper protection from gusty wind and help you keep your body heat while you auger that perfect fishing hole and start dropping the lure and/or bait! This windbreak shelter is built on a sled base that makes it easy to move on and off the ice while also allowing for very easy and fast setup once you’re familiar with the basic design (Author Note: the big drawback on Shappel’s windbreak shelter here is that the setup instructions are actually pretty abysmal. The pictures are only mildly helpful as a guide while the instructions are really bad – they need to hire a new technical writer, IMO. However, once you go through setup once, it’s very easy to see how it works and to replicate again and again). The material fabric used is a strong and reliable 300-denier nylon that is designed to stop wind in its tracks as well as last despite the wear and tear of the years. This is a very solid construction and the interior includes a carpeted bench seat for a little bit of extra comfort when you sit down and set your line. The shelter only weighs 27 lbs and is made in the United States. When fully folded, the shelter is only 18 inches at its height, and that means it is easy to pack away. This shelter is designed to be pulled or carried easily, and if you need a little extra heat to go with the wind break, something like a Coleman propane heater could potentially be a way to even out some of the more extreme cold. Mostly gray/silver and black with the “Frabill” brand name in big yellow letters, this definitely varies from the red of Eskimo products or the blue and orange of many other manufacturers, but that doesn’t mean they don’t hold up in comparison! While relatively new on the scene and still a bit unproven compared to the other names on this list, the early signs are good! Featuring a very symmetric 80 x 80 x 80 inch design, this insulated ice fishing shelter follows an over-sized hub design, giving all the benefits of earlier hubs that were well received by ice angling enthusiasts and building on their feedback to create over 30% more space for fishing. Lightweight roof insulation is combined with thermal side insulation to make sure the heat stays in where it belongs – with you and not dissipating into the cold winter air around you! This is from “The Bunker” series by Frabill and is an outstanding option for ice anglers looking for something new and hoping to get in on a truly high quality outdoor product. The early reviews on this particular ice fishing shelter are excellent and build off the success of the other already popular and successful previous line of ice fishing shelters. If you’re looking for something for 2-3 individuals that is easy to set up but performs well so all of you can enjoy your time on the ice then this is a good option. There are many different factors that go into choosing the right portable fishing shelter that meets each and every one of your specific winter ice fishing needs. Even the most dedicated of angler has his or her breaking point, so the more comfortable you can be even during the cold, windy, or snowy winter days, the longer you’ll be able to fish and the more you’ll be able to enjoy it. These are the two general styles of ice fishing shelters, and even shelters advertising under one or the other are generally some variation of one of these main two designs. Do your research on which one is most likely to suit your needs. The dome ice shelter is very much like a tent including solid ice anchors and creates a nice floorless tent effect. One important thing to know is that setting this up and anchoring means you need to choose your spot well because once a pop up ice shelter is up, it’s up. It might be portable to get out on the lake and put up and take down, but this is not the type of shelter that you can just easily shift from one place to another. Flip style shelters are absolutely all about the mobility. They are built into a tobagan, are easy to move from place to place, but they tend to be much more expensive, as well. 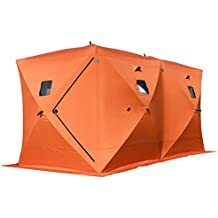 These are great if you tend to move from place to place or “run and gun.” If you’re going to move if they don’t bite quickly, then this is probably the type of shelter you want to go with. That being said, there are many other factors that go into picking out the right ice shelter for you. A little research, and sticking to the top rated designs, can go a long way to helping make sure all your ice fishing adventures are fantastic ones. If you need more information, you can also check out this excellent article about picking out the best type of ice shelter for your specific winter angling needs. Q: Should I go with an insulated model or uninsulated model? A: Each angler is going to have their own preference, for us the obvious choice is insulated. A little extra warmth in winter is never a bad thing and if the temperature starts really dropping or wind picks up that little extra bit of protection can make a big difference not only in how long you can stay on the ice but how much you enjoy yourself as you do. Q: Isn’t this temporary ice shelter a bit small for “X” number of people despite how it is advertised? A: There are a variety of factors going into this. In the same way that sometimes tents are a bit small for what they’re advertised for, it never hurts to get a shelter a touch bigger than advertised. That being said, since people aren’t going to be laying down to sleep in an ice shelter so the sizes are usually more accurate than with tents – but remember to adjust if your group is full of really big sized guys or gals. Q: Who makes the best ice fishing shelter? A: This type of question is going to have a lot of debate over it. There are many great options out there, but we have to go with Eskimo fish shelters. There’s a reason they take the top two spots in our top rated listed, and four of the top six spots overall. They make incredible portable ice shelters and have really honed their craft in this niche. Q: Where do I find ice fishing shelter replacement canvas? A: That’s a tough one. Hopefully this is a problem only after many years of uses. Your best option is to contact the company directly that makes your particular shelter model, although with canvas in particular, you may be stuck with purchasing a new model unless the one you own is under warranty. Q: Where are the best places to find ice fishing shelters on sale? A: Plenty of options with the best generally being online at places like Amazon or on excellent review sites like this one (if we do say so ourselves). Craigslist, Backpage, and local garage sales might offer options, but there are plenty of caveats with all of those potential options. Q: Can I tow the flip style ice shelters? A: Yes – but you need to make sure you have the proper tow bar and any other appropriate gear for towing the ice shelter. This really shouldn’t be an issue for anyone with a snowmobile or an ATV to get a good tow bar and go from there. Q: Do I need a license to use these shelters? A: 99% of the time “No,” but check with the local DNR anyway. Most states and provinces require some type of a license for a shanty or more permanent seasonal shelter setup on the ice, but for tent like shelters out of fabric there’s no reason for a license for something you bring in and bring out, but it never hurts to check up on the exact rules locally to confirm this. Q: Do these really make ice fishing better? A: Would you rather sit out in wind and cold (or with the glare of sun blinding your eyes off the snow and ice) during winter? A good fishing shelter makes a big difference no matter what the overall weather/temperature on the day. There are a wide variety of various ice fishing shelters to choose from, and you shouldn’t have a problem finding one that suits you. While the impressive fishing shack from the beginning Anthony Bourdain video in the intro might be ideal, for many of us it is not a realistic option but an outstanding portable temporary ice fishing shelter is. There are many great options out there, so make sure to find one that is right for you and enjoy your time out on the ice. Maybe we’ll even see you there!